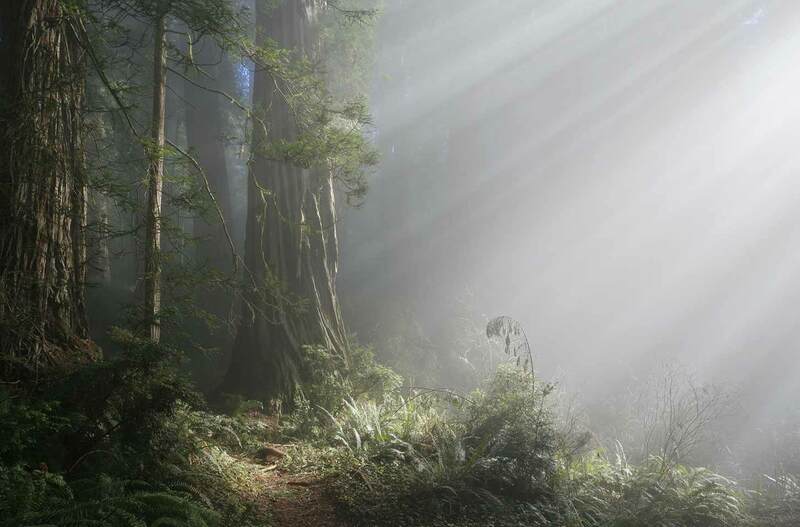 As a hiking destination, though, Del Norte Coast Redwoods is a little disappointing. 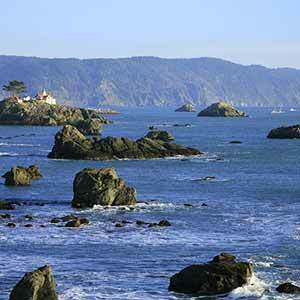 Highway 101 runs right through the narrow band that contains the largest and most scenic redwoods, just west of the park’s highest ridge, so those photogenic scenes are usually accompanied by the roar of trucks. Also, there are only two old-growth trails, and the longer of the two (the Coastal Trail), while very scenic, misses most of the really good redwoods. Del Norte Coast Redwoods has a very nice campground. 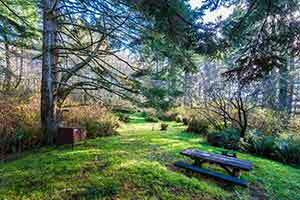 Located well away from the highway, it’s the only one of the three state-owned campgrounds in Redwood National and State Parks that doesn’t get any traffic noise. 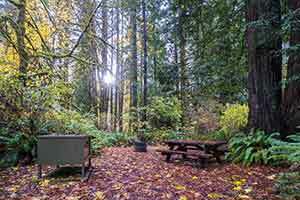 Although there aren’t any old-growth redwoods, the campground is located in an attractive wooded area and it feels less crowded than other local campgrounds. 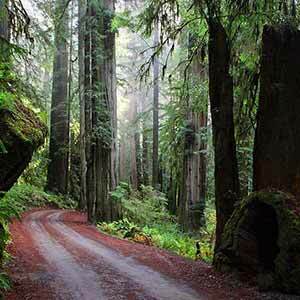 The main drawback is that seeing any old-growth redwoods requires getting in a car and driving. 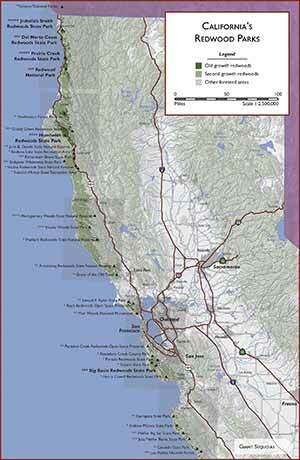 Del Norte was dramatically expanded by the addition of the Mill Creek watershed. 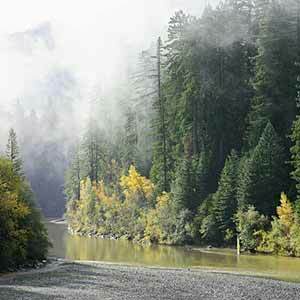 This 40-square-mile property was purchased from Stinson Lumber Company in 2002 to protect Jedediah Smith Redwoods from the detrimental effects of upstream logging. The area was almost entirely clearcut in the 1970s, 80s, and 90s and only a few small old-growth fragments remain. The watershed contains an extensive network of dirt and gravel logging roads, many of which are now being removed. Some of the remaining roads have been designated as trails and are open to the public for hiking, horseback riding, and mountain biking between 9 am and 5 pm on weekends (if you’re not out by 5 pm you’ll be locked in). 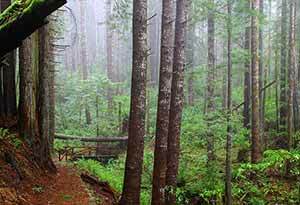 The state plans to eventually designate a new trail network (still based on the old logging roads) in addition to building a visitor center and much-needed in-park lodging on the site of the former mill. It’s a good idea to continuously record a track with a GPS unit and also use a good map when hiking or riding in the Mill Creek Watershed. There are a lot of roads here, they all look the same, and they go on for miles without ever arriving anywhere. Fortunately the timber company road signs are still up, but there are few park signs to keep you on the trail or direct you to a destination. If you get lost here, it could be very difficult to find your way out. 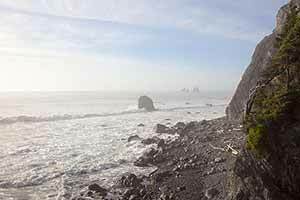 Del Norte’s most scenic trail descends 1100 feet through old-growth redwoods from Highway 101 to a small rocky beach. 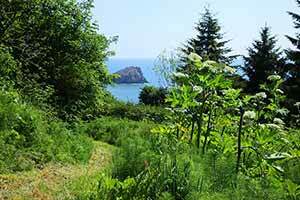 This enjoyable hike is one of the best sections of the Coastal Trail. 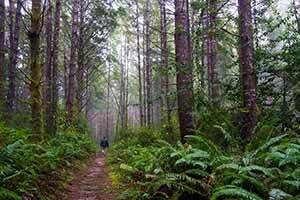 About half of the hike is through old-growth redwoods; the rest is through mixed-species woodland. 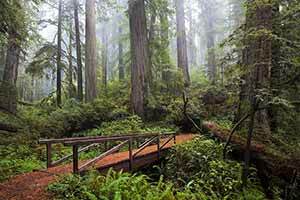 This hike starts with a 3-mile climb through non-redwood forest, then enters old-growth redwoods. 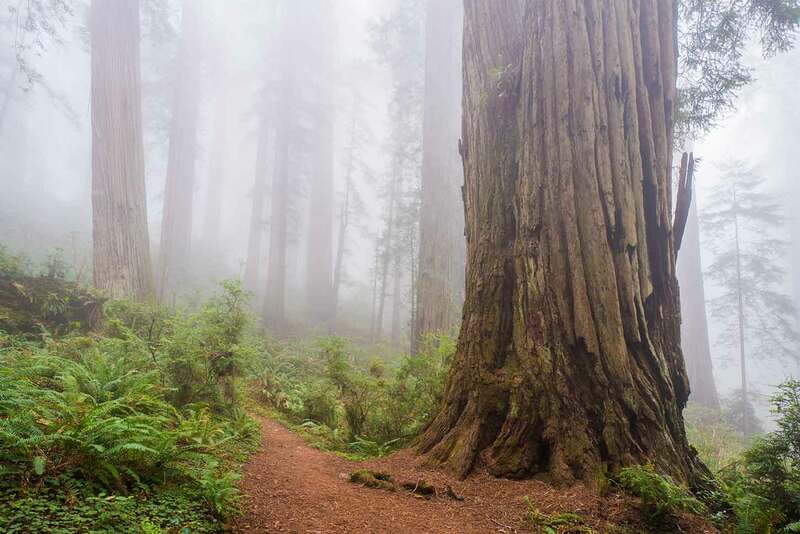 If you’re just interested in the old growth, start from the Damnation Creek trailhead and go north until the old growth ends; that way it’s a flat, easy 10-mile out-and-back entirely through old-growth redwoods. 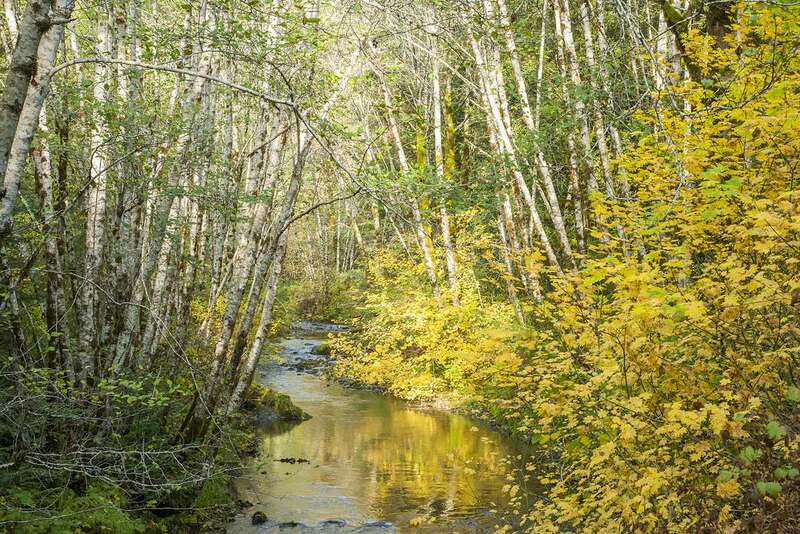 This long, peaceful hike explores the old logging roads of the Mill Creek Watershed. 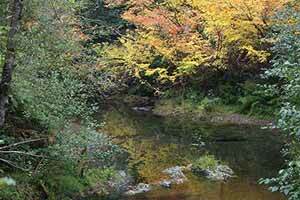 Part of the Mill Creek Watershed, this old dirt road runs through pleasant leafy scenery along a branch of Mill Creek. 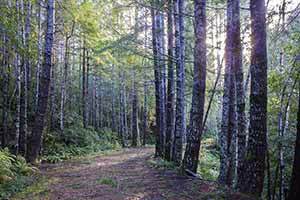 This loop explores a logged hillside above the Mill Creek campground. Mill Creek Campground doessn’t have any any old-growth redwoods, but it’s in an attractive wooded area and feels quieter and less crowded than other local campgrounds. The main drawback is that you have to get into your car and drive to see any old growth. DeMartin is a backpacking campground on the Coastal Trail. It’s on a sunny plateau with patchy spruce and alder woodland but no redwoods. 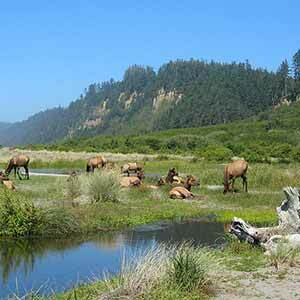 The park is on Highway 101 just south of Crescent City and about an hour north of Arcata. There is no main entrance and no visitor center. 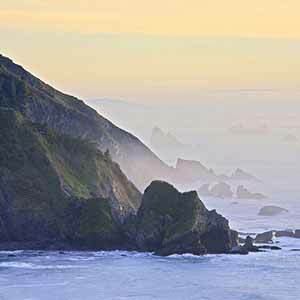 Like most of Redwood National and State Parks, there’s no entrance fee.